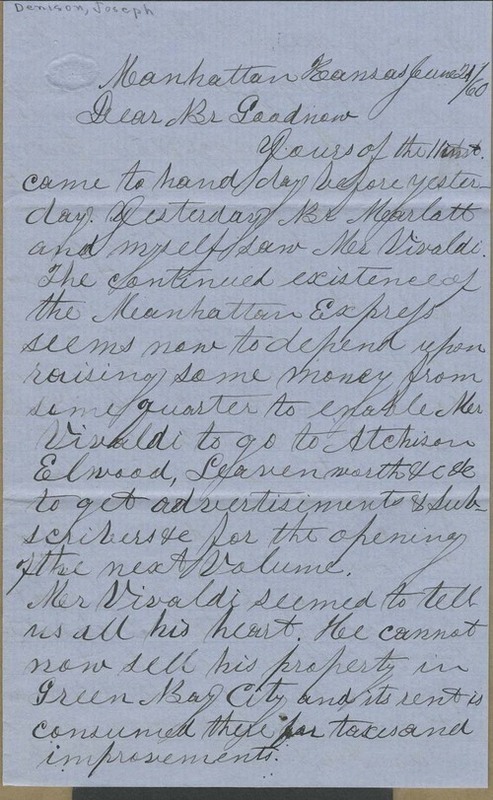 Joseph Denison wrote from Manhattan, Kansas Territory, to Isaac Goodnow. Denison reported that Charles de Vivaldi, editor and owner of the Manhattan Express newpaper, was having financial trouble. He asserted that it was in their own best interest to help him out, lest the demise of the newspaper "discourage & sour" their investors. Such a loss of confidence would "injure the College and all other enterprises here beyond calculation." Denison also congratulated himself and Goodnow on thus far avoiding legal trouble related to the construction of Bluemont College.